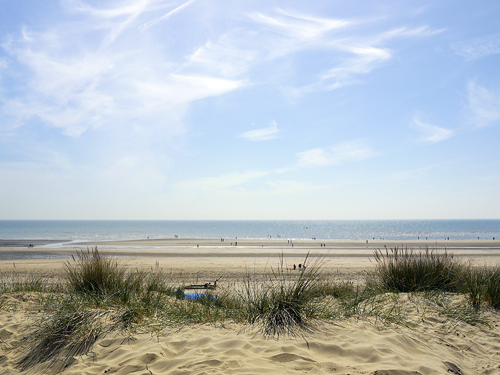 It’s a public holiday today in London – but my visions of a warm day at the beach or in the country were knocked on the head by the lashing rain that appeared this morning! Making the most of an unexpected day in the house, I’ve finished sorting through three years worth of administration and vacuumed and generally tidied the house. I know – very rock’n’roll! Then the moment came to reverse all the good work in the kitchen by embarking on a spontaneous culinary exploit. So, forgetting the rain, today was also the start of what might be tentatively called “festive baking” as I’m making something that I’m looking forward to eating at Christmas – a sharp-but-sweet spicy tomato jam that is a great addition to a cheeseboard. It also means I can use some of our garden produce and enjoy them later in the year – our tomatoes were better this year than we managed last year (2014 yielded just three tomatoes! ), but I’ve also got some big plans for next year to really get the most out of our garden. It might be small, but I’m determined to use it to grow useful things out there! This is actually somewhere between a sweet jam and a chutney – it sets and is made with a lot of sugar (like jam), and while it has spices, salt and vinegar that you’d expect in a chutney, it doesn’t have onions or sultanas. It is in turns fruity, sharp, tangy and savoury, with little bursts of flavour from the spices I used. 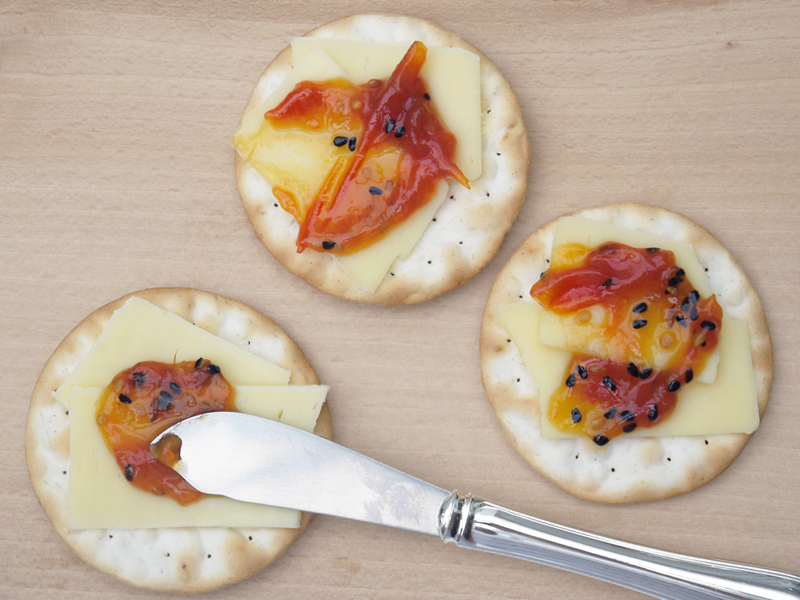 It is absolutely delicious with strong cheddar on oatcakes or crackers, and a little goes a long way. I made this using cherry tomatoes – partly the result of a glut that we’ve got in the garden at the moment, but you could just as easily do this with bigger tomatoes, red, yellow or even green. I cut half of the cherry tomatoes in two, and trimmed the rest into quarters so that there is some variation in size in the finished jam. If you’re using bigger toms, then you’ll need to chop them into smaller pieces, unless you’re the kind of person that enjoys really chunky jam! I also let the tomatoes cook down in a bit of water so that they break down a bit before adding the sugar. If you add the sugar with the tomatoes at the start of cooking, it can stop them breaking down and leave you with large lumps. This doesn’t affect the flavour, and I think is really just a matter of aesthetics. A word of warning – this recipe does not make a lot of jam, but that is not really an issue as you only need a little as it is packed with flavour. 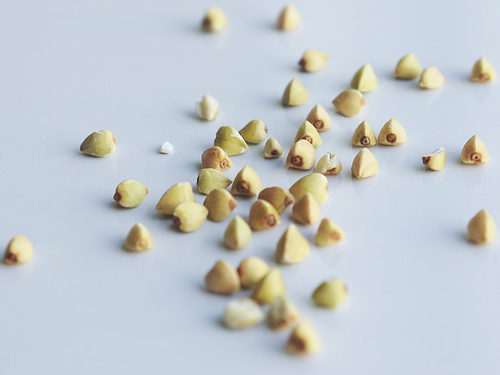 As it is easy to make, you can play around with different versions – I like nigella and cumin seeds, but you can also try aniseed or ginger and chilli. Using different colours of tomatoes also looks pretty – yellow tomatoes will keep their golden hue, while red tomatoes will produce anything from a deep orange to a ruby colour. I’ve ended up with one small jar that I can eat over the next couple of weeks, plus a large jar that I can keep in a cupboard for the December festivities. 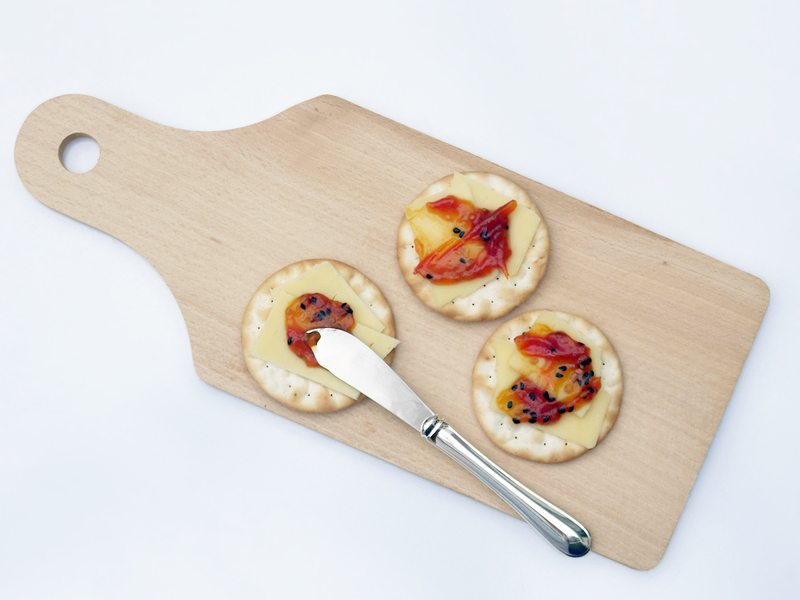 Now…let’s see what cheese I’ve got in the fridge to test out this batch? 1. Rinse the tomatoes and cut into a mixture of halves and quarters, removing the stalk part from each. Place in a saucepan with the water and cover. Bring to the boil, then simmer gentle for around 20 minutes. 2. In the meantime, dry toast the nigella and cumin seeds – put them in a saucepan and warm over a medium heat until they smell fragrant. Once done, pour them onto a cold plate. 3. Add the rest of the ingredients (apart from the lemon juice) to the tomatoes. Mix and bring to the boil, then reduce the heat and simmer for around 10 minutes. Add the lemon juice, the boil until the setting point is reached(*) before decanting the jam into prepared sterilised jam jars(**). (*) How to check for a set? Chill a saucer in the fridge. Put a little jam on the cool plate, and return to the fridge for a minute. Push with your finger – if the jam visibly “wrinkles” when you push it, the jam is done. If it stays liquid, then cook longer and check again after a few minutes. (**) How to sterilise jam jars? Wash in hot, soapy water, and then rinse very well – do not dry them. Now place up-side down on the shelf of a cold oven, and heat to 100°C / 210°F for 20 minutes. Remove from the oven using gloves, allow to cool slightly (they should still be warm) and fill with the hot jam. You can leave the jars in the oven with the heat turned off until you need them, as this keeps the glass warm, and warm glass is much less likely to crack when you add warm jam (science, eh?). Remember to sterilise the lids by washing in hot, soapy water, then rinsing well and then boiling them in a pot of hot water for a few minutes. When I was younger, I was never really a fan of aubergines. In my student days, I started to experiment with them, and while I was always aware that aubergines mop up oil like a sponge, I still always ended up with something greasy and, well, just not that appealing. I probably made the novice error of adding more and more oil as the aubergine was cooking. Yes, this meant that I endured many, many meals involving badly-cooked aubergine with too much oil served pasta, with salt, pepper and spices seeking to mask the horror that I had cooked up. These days, however, me and the aubergine have made up and get along just fine. I love them smoked and made into salads or baked and turned into baba ganoush (even if they’ve been known to explode all over the inside of my oven), but most recently I’ve been making lots and lots of this simple aubergine and tomato sauce. 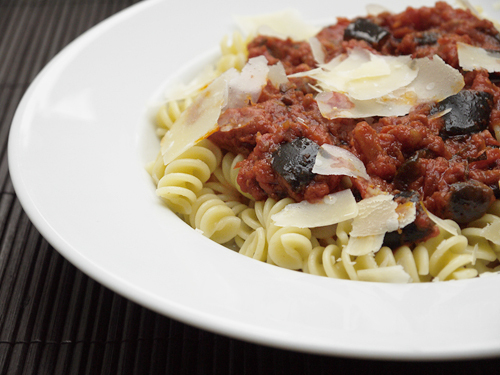 Very easy, very delicious and fantastic with pasta. 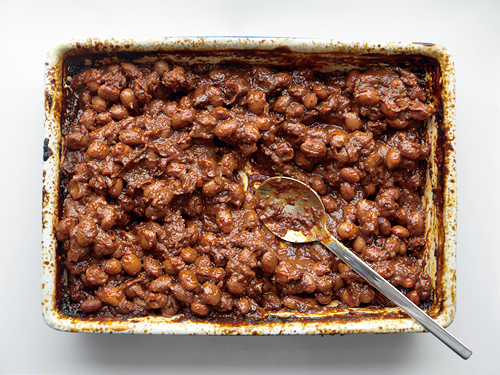 This recipe really is sheer simplicity. 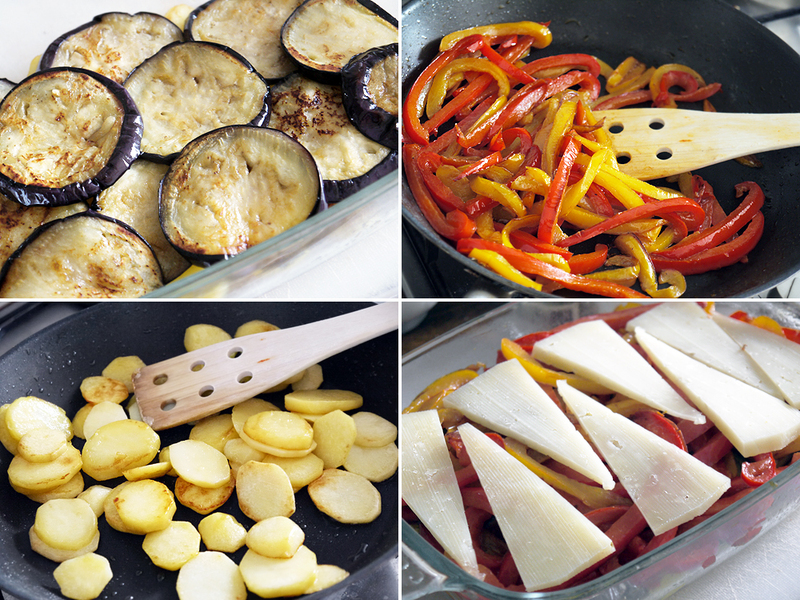 Just chop the aubergine into small cubes, then put into a pan with some olive oil and salt. At first, all the oil is soaked up, and you think that nothing will happen when you cook it. But be patient, and the aubergine transforms into something browned, soft and delicious. The flavour is rounded out with some tomatoes and herbs, and that’s about it. 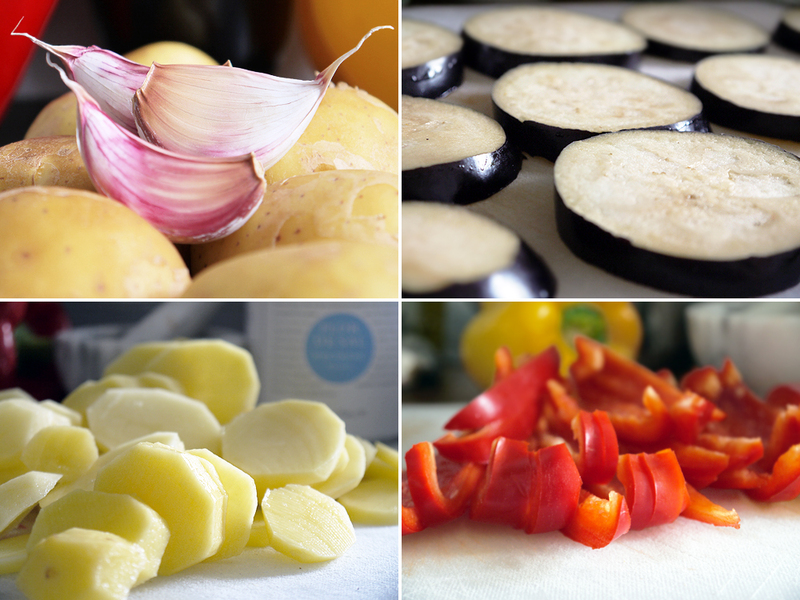 This is great on pasta, cannelloni, polenta, gnocchi…with chillier days, that’s the sort of stuff we like! 1. Cut the aubergines into 1 cm (1/2 inch) chunks. Put into a large saucepan with the olive oil and a generous pinch of salt. Cook on a medium heat until the aubergine is soft and it is starting to brown, around 15 minutes (At first, the aubergine will soak up all the oil, but keep heating it and it will release the oil and cook down). 2. Add the rest of the ingredients, stir well and adjust the seasoning if needed. Leave to simmer on a low heat until the sauce has reduced down. 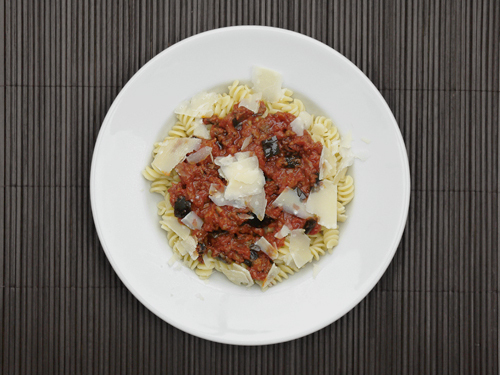 Just before serving, adjust with a little water and/or olive oil if needed (this sauce can be made ahead and reheated at the last minute). Worth making? I reckon so – I’ve probably made this four times in the last three weeks! I’m finding it hard to decide if summer is over. Is that it? Are we going to ease into chillier days via a bright, sunny but fairly fresh period of weather. 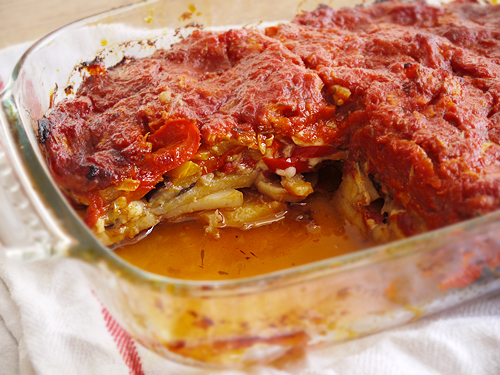 Is it time to get out the lentils, pasta and various potato bakes? Well, not quite. I’ve still found that there is a warmth in the air in the early evening, so at the moment, I’m still quite happy to enjoy fresh salads before succumbing to cheese pasta bakes that will be on the menu come late September. Indeed, this weekend, it seems we are due to get another blast of heat from Continental Europe, so I’m sure we’ll get one last hurrah out in the park with a picnic before the chilly embrace of autumn comes upon us. I’ve done posted a few salads recently, so today it’s more of the same I’m afraid. One of my favourites is the Middle Eastern fattoush, which is a lovely collection of fairly chunky vegetables, finished off with lots of crisp bread and flavoured with a sharp, lively dressing made with lemon and ground sumac. Fattoush can be made with pretty much whatever you have to hand – I’ve used a fairly traditional recipe with cos lettuce, tomato, red peppers, radishes, carrot, parsley, mint, spring onions and cucumber – and finished it with toasted flatbread and a dressing made with lemon juice and sumac (ground red berries that impart a fruity, sour flavour to the dish). This dressing is key – it needs to be fresh and it needs to be sour. However, you can of course add whatever other vegetables you fancy – like shredded red cabbage, mushrooms or onions – there are no hard or fast rules. In fact, onion is fairly traditional, but it can be a little overwhelming in a fresh salad, so I tend to omit it (and anyway, the milder spring onions seem to do the trick here). Now, the bread. 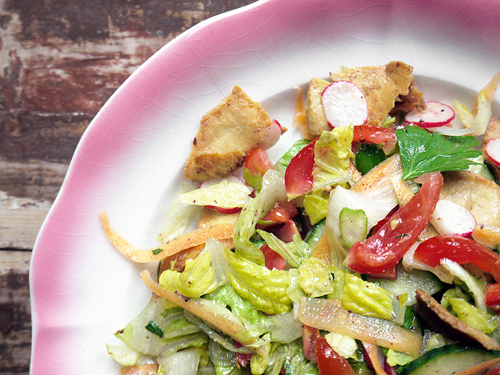 This is so fundamental to fattoush that it is often called a toasted bread salad. 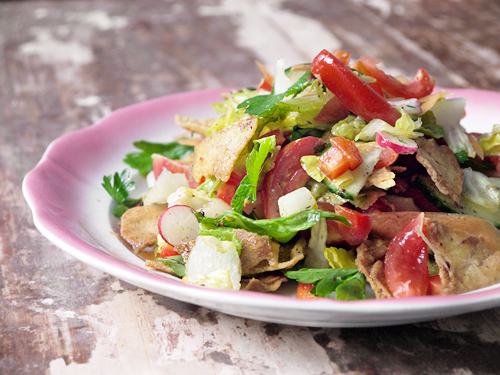 I’ve seen various versions of fattoush that suggest using any sort of bread that you can lay your hands on. I’m going to stick my neck out and suggest that this isn’t really the case. When made with things like cubes of sourdough bread, the effect is something more like large croutons than a salad that suggests the warm evening air of the Levant. No, I prefer to use flatbreads (the ones that look like a cross between a tortilla and a pitta), tear them up and toss in olive oil. Popping the bread into a hot oven allows you to keep a close eye on it, so you get pieces that are golden, toasted and crisp, but with none of the burnt bits that you can get it you shallow-fry the bread in a pan. 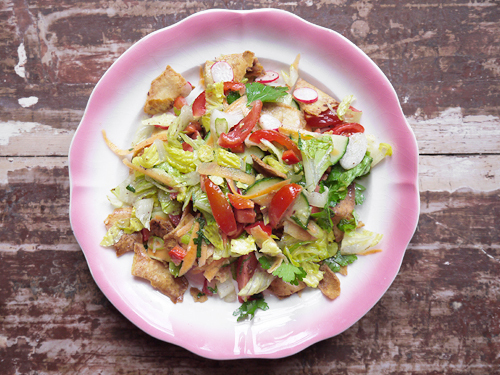 My three top tips for making excellent fattoush are fairly simple. First, the ingredients should be fresh but at room temperature. Carrots, tomato and radishes taste so much better if they are not icy-cold and straight from the fridge. Second, make sure the dressing is properly sour, made with lemon juice and sumac. This is the proper flavour of this salad. And third, keep the toasted bread apart from the rest of the salad, and only combine the vegetables, bread and dressing just before serving. This will keep the green leaves perky and the bread crisp. The salad tastes so much better if you have all the contrasting textures as you eat it. 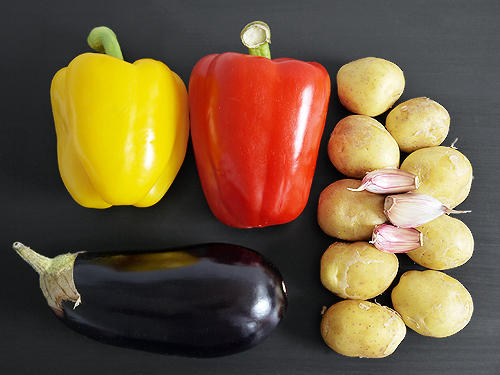 Colourful, tasty and healthy – you can you resist? 1. Tear the bread into pieces. Add the olive oil, tossing the bread to coat it, and place on a tray and bake in the oven at 180°C (350°F) until golden brown (watch it like a hawk – it goes from golden to burn quite rapidly). Remove and allow to cool. 2. Put the rest of the ingredients into a large bowl and toss to mix. 3. Make the dressing: put the sumac in a jam jar and add the boiling water. Allow to sit for a few minutes. Add the lemon juice, olive oil and salt. Seal the jar and shake vigorously until you have a smooth dressing. Add more lemon juice or olive oil as needed. 4. Serve the salad – add the bread to the salad, add the dressing and toss to ensure everythign is coated. Serve immediately. Worth making? This is a great salad with lots of tastes and textures, and very fresh thanks to the use of lemon, parsley and mint. Good for a summer’s day as part of a picnic! I’m probably veering into dangerous territory here, by making a classic Middle Eastern dish that has so many “correct” versions. If you’ve got opinions, then great, leave a comment! I’m always happy to work towards perfection. But when it comes to tabbouleh, what is pretty clear is that this should be first and foremost a parley salad, and on that point, I’m not keen to be persuaded otherwise. How you make it…well, this is where it’s all up to you. Now, I say that this should be a parsley salad, but all too often you find this tends to be served up as a large cous cous dish with some parley strewn through it. Wrong. 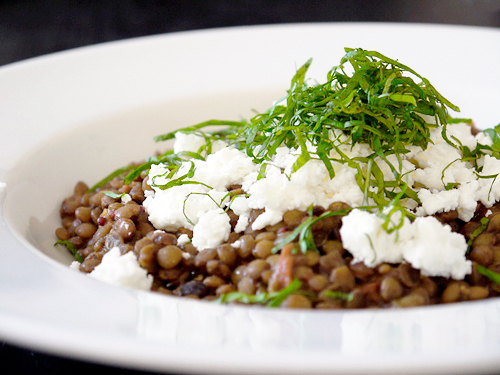 It’s all about parsley, with a few goodies thrown in there for flavour and texture. And it’s not cous cous that you use, but bulgar wheat. My approach starts with the “low effort” route, beginning with the dressing. 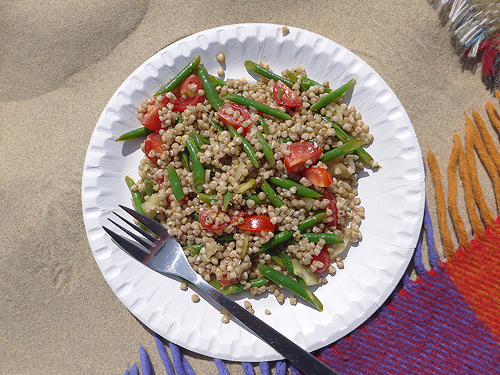 This involves little more than olive oil, lemon juice, seasoning and a little chopped tomato and red onion, which is left with a few spoons of uncooked bulgar wheat. Easy to do the night before, so you can leave it in the fridge to sit overnight. This is the easy bit. 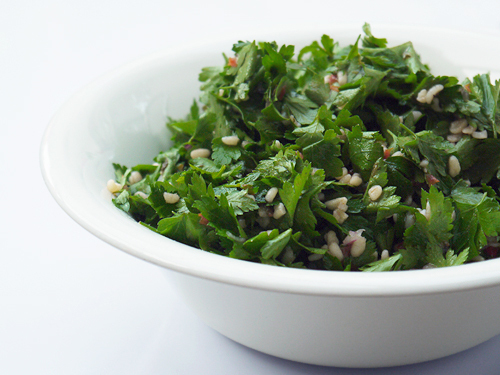 The other part of making tabbouleh is something that can be tedious – picking all those leaves off some bunches of parsley. It might take some time, but it is the perfect job for when you’re listening to a radio play and are not in a hurry. However, if you’re the sort of person that doesn’t like to wait, then you could just chop the parsley as is, stalks and all, and just tell your guests “this is the traditional way to make it“. However, I prefer to pick the leaves off in the patient way, and them leave them pretty much whole in the salad as I like the shape they give the salad. You can, of course, chop up the leaves if you like. Then, when you’re ready to serve, dress the parsley with the sauce (if you’re making ahead of time, wait until the last moment before mixing everything). If you make this, it sort of goes without saying that you need to really like parsley. Done in this way, tabbouleh makes an excellent side dish – add some grilled halloumi, some hummus, toasted pitta and some sliced tomatoes, and you’ve got a (fairly) quick and delicious light lunch for a summer’s day. 1. 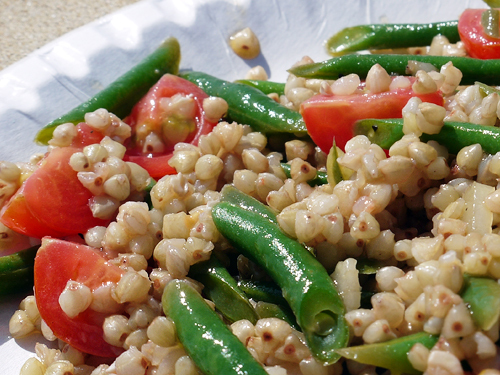 Soak the bulgar wheat in cold water for 15 minutes. Drain. 2. 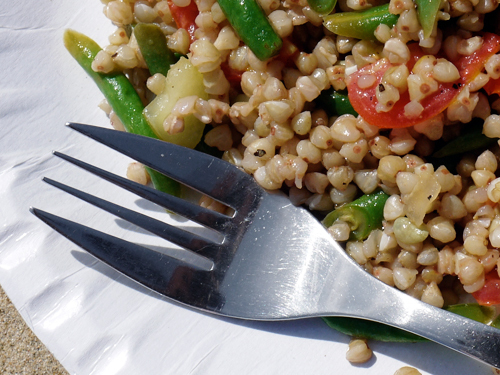 Mix the bulgar wheat, olive oil, lemon, tomatoes and red onion in a bowl. Add salt and black pepper to taste. Leave to sit for at least an hour or overnight, until the bulgar what is soft and the dressing a little thicker. 3. Prepare the parsley – remove the leaves from the stalks. Chop roughly if you want a finer texture (use a big, sharp knife, and try to keep the parsley fairly dry – I prefer to keep the leaves whole). Add the dressing and shredded mint, toss and transfer to a serving dish. Worth making? Yes – this is a light, fresh salad. Great as part of a summer lunch or dinner.